Ylang Ylang is high in sesquiterpenes. Sesquiterpenes are a class of chemicals common in higher plants that are naturally occurring alcohols. Sesquiterpenes rarely exist in volatile aromatic oils. When distilled from plant matter sesquiterpene compounds are known to have a stimulating effect and may especially helpful for promoting liver and endocrine gland function. Sesquiterpenes give Ylang Ylang its powerfully antispasmodic and sedative properties. Inhalation of Ylang Ylang may be useful for dispelling fear and anxiety, and the first essential oil to consider when needing help for balancing the nervous system.Ylang Ylang may be helpful for deepening cellular respiration. Inhaling Ylang Ylang while practicing rhythmic breathing assists in regulating blood pressure, it's also aphrodisiac and good for the reproductive system. May also be helpful for treating panic attacks. Research studies show that Ylang Ylang oil stimulates the Central Nervous Systems and may help alleviate depression. Ylang Ylang essential oil has been used as a natural remedy for soothing tachycardia and hypertension. Often used in massage oils, lotions and perfumes, Ylang Ylang may be helpful for relieving muscular aches and pains. Try Ylang Ylang oil to assist with relieving PMS symptoms, including Mood Swings. May also be effective for reducing emotional blockages in the heart region. A distinctly feminine (yin) oil Ylang Ylang is passionate and alive with feeling. Try Ylang Ylang when you’re needing to integrate and heal shadow elements of the Divine Feminine. It will activate the Divine Feminine’s mysterious allure and capacity for living life fully. Ylang Ylang stimulates feelings of enjoyment and self confidence and can be helpful for overcoming performance anxiety. Often used in men’s fragrances Ylang Ylang is a healing oil for men. Ylang Ylang supports a man’s connection and expression of the feminine and intuitive side of his nature. Ylang Ylang oil may help neutralize defensive coping strategies that can lead to violent forms of communication. 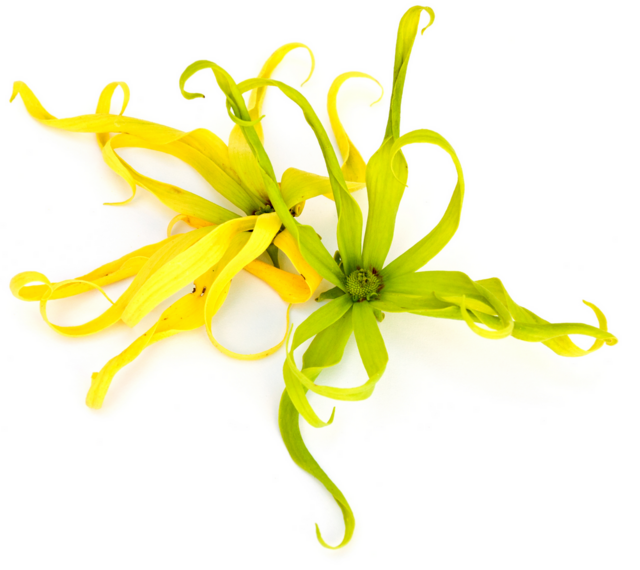 Ylang Ylang has a synchronizing effect on the Mind and Emotions. May help soften fixed opinions, mental attitudes and judgments, as well as promote easy communications with others. Try using Ylang Ylang oil when you’re needing to smooth tense situations and heal your relationships within yourself and with others. Instead of being quick to react simply take a deep breath of ylang ylang. Ylang ylang mixes great with Lavender also adding to that calming effect while adding a spark of peppermint can energize and add a revitalizing touch to your respiratory system! Ooh La La! Ylang Ylang also supports kidney and adrenal function and may be useful for weak knees and loss of bladder control. Ylang Ylang has been traditionally used in beauty and skin care as its plant hormones promote cellular regeneration.Its moisture balancing effect on the skin’s natural sebum production, makes Ylang Ylang suitable for sensitive, oily, dry and mature skin types.